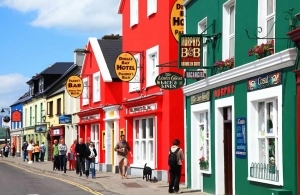 The Dingle peninsula offers some of Irelands most beautiful scenery. To the north rises towering Brandon Mountain, while the west coast has some magnificent seascapes. 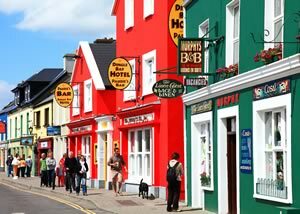 The area has a host of antiquities from Iron Age stone forts to inscribed stones, early Christian oratories and beehive huts. 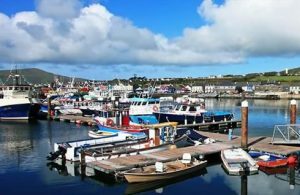 Some parts of the Dingle peninsula are Gaelic speaking Dingle town is full of brightly coloured houses and good restaurants but still maintains its fishing village ambience. 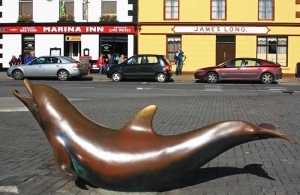 A more recent addition to the town is Fungie, a dolphin who strayed into the bay in 1983 and has been winning hearts since. 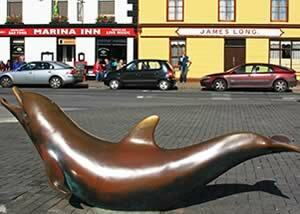 He sometimes can be seen at breakfast time from Emlagh House. 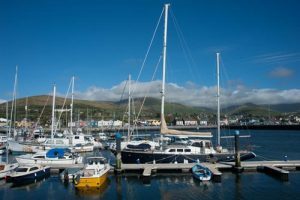 As it is an enclosed natural harbour Dingle has always been a favoured port of call, especially in the 14th and 15th century when it was Kerry’s major port and in the 16th century when it was important enough to be a walled town. Later on its remote location helped to establish it as a smuggling centre and at one point in its history it went so far as to mint its own coins. 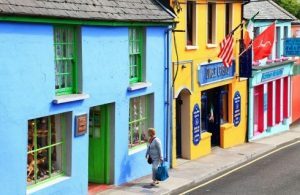 The towns past is very much in evidence at Dingle Library.